If your blinds were measured or ordered with the incorrect size, we highly recommend that you send them back to the factory in order to be cut down to the correct size. If you decide to cut them yourself, follow the instructions below. You may need to cut the valence, headrail, and slats. Note: Some of the repairs listed below will void the warranty. To cut the headrail, a hacksaw or tin snips can be used. You won’t need to be particularly picky when it comes to the look of the headrail since it won’t be seen once it is placed in the box type brackets. Measure and mark where you would like to cut. If you only need to cut a small amount off, then remove it from the lift side of the headrail. Otherwise, an even amount should be cut off both sides. Take the end stiffener off the headrail. Carefully cut the headrail along the marks that you made with the hacksaw or tin snips. You can use pliers or a screw driver to bend the cut portion out of the way as you cut. Using pliers or a screw driver, bend the ends of the headrail back into place. Replace the end stiffener on the headrail. Cutting your blind slats is a bit of a tougher job, and will require the use of a powered saw. You should slowly saw the slats with a blade that doesn’t have much bit in order to do a good job. If you decide to use a hand saw, hacksaws are preferable to standard carpenter saws. Align the slats so that they are even, then secure them together with rubber bands or a clamp. 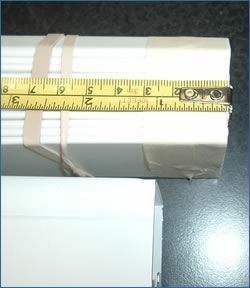 Use masking tape to wrap the slats to avoid chipping. 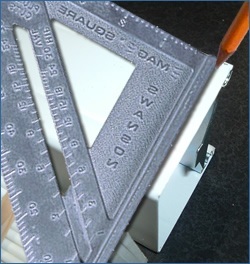 Measure and mark where you will cut. Make sure the masking tape covers this area. 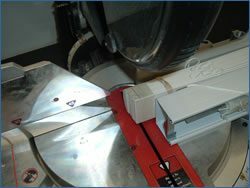 Place the slats on the saw then line up the blade to where you want to cut (taking into account the width of the blade). Slide the headrail and clamp out of the way to ensure they do not interfere with the saw. Cut through the slats slowly. Remove the tape and rubber bands or clamps. Measure and mark where you want to cut. To determine the correct size, you can either measure your window then cut the valence 1/8” shorter, or hold the valence up to the window and mark 1/8” shorter. Lay the valence on the saw then line up your blade with the mark. 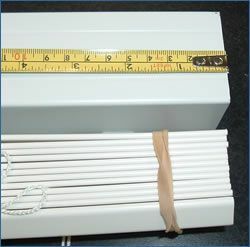 Nobody wants to order blinds that won’t fit their windows, so it’s important to measure correctly the first time around. All windows are different, that’s why we customize every blind to your specific measurements. By using our easy-to-follow measuring instructions, you’ll never need to cut your own blinds. Check out our video to learn how to accurately measure your windows by first deciding whether you want inside or outside-mounted window coverings.